NASA's newest space telescope — a black hole-hunting observatory — unfolded a giant mast in orbit Thursday (June 21), one of the final steps before it can begin peering deep into the universe. The $165 million Nuclear Spectroscopic Telescope Array (NuSTAR) is an X-ray observatory designed to study some of the most energetic and mysterious places in the universe through X-ray light. In order to focus these very short-wavelength, high-energy light rays, the telescope must separate its light-gathering optics from a focal point a distance away. That's where NuSTAR's mast comes in. The 33-foot (10-meter) boom made of stackable cubes formed by carbon fiber rods serves to distance the telescope's two X-ray optics from the focal point where its camera is placed. "The high energy nature of the mission means we're trying to push beyond the conventional X-ray band, what we call soft or low-energy X-rays," said William Craig, NuSTAR instrument manager at the University of California at Berkeley. "Mirrors can reflect or bend high-energy X-rays, but they can only put in a little glancing angle, so it takes a long distance for it to come to focus. It turns out that 10 meters is the right one to give the focus and energy range we need." "The mast has deployed! We are on our way to getting the best views yet of high-energy X-rays in our universe!" the telescope's team wrote on Twitter after the event. 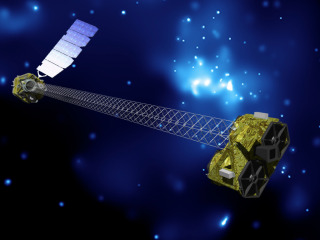 The NuSTAR observatory is expected to begin its normal science mission July 31. The NuSTAR mission launched June 8 and has been going smoothly so far. Its planners, who have devoted years to preparing the spacecraft, say it's a heady feeling to have it finally in space. "Its tremendous, there's no better feeling in the world really," Craig told SPACE.com Wednesday (June 20). "You work through development of the technology, getting it through the NASA process to get it funded, and now it's just going surprisingly well. I think the entire team is excited right now." Now only one more major step stands between NuSTAR and the start of its operations. Scientists are planning to instruct the telescope to turn on its X-ray detectors Friday (June 22). Afterward, NuSTAR will point its X-ray eyes at the nearby black hole Cygnus X-1, which is in our own galaxy. These observations should allow mission controllers to test the telescope's focus, and also gather better pictures of Cygnus X-1 than have been available before in this energy range.